A Nation has boundaries, where as Religion does not, and we should not contain religion into national boundaries. The following article is reflective of America, the one that I envisioned, where freedom of expression, freedom of association and freedom of thought and just pure freedom is the essence. America is all about freedom to me, the freedom that comes with duties, rights and responsibilities.The separation of church and state is a value we ought to be proud of, and that is one of the values that makes our nation a great country. We are going to enjoy the fire works sitting across our home in Coyote Ridge, with a panaroma of fire works across the city, on the top of the hill across the pond. Not Henry David Thoreau’s, but our City’s. Let me add a historical tid-bit; The first three nations to recognize the independence of United States of America were; France, Morocco and the Kingdom of Mysore (Karnataka State in India). The Sultan of Mysore, Tippu Sultan, sent the letter (which sits in French Museums) congratulating the nation and celebrated the freedom by Fire Crackers. This part of the history was researched and published by Dr. Range Gowda, my friend in Bangalore. Those who live in Dallas can join us to watch the fire works, Bring your own chair and enjoy the freedom. By Tom KrattenmakerThe Fourth of July is a time for Americans to honor our country and, for the many religious people among us, to honor God. 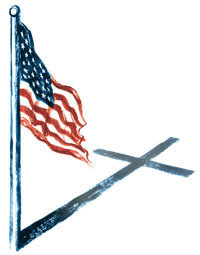 But as the fireworks explode on Independence Day, let’s resist an all-too-common tendency these days to drape the American flag around the Christian cross. Let’s remember that religion is not patriotism, that patriotism is not religion — and that when we combine them both with a glorification of American military might, something has gone disturbingly askew. For one evangelical leader here in Oregon, the conflation of patriotism and Christianity reached the point where he took action that’s considered anathema in many conservative church communities: He publicly spoke out against what was happening at his church. Bob Hyatt, now pastor of the upstart Evergreen Community in the Portland area, worked on the staff of a local megachurch in the fevered period immediately after the 9/11 attacks. Despite being raised and educated in a strict Christian conservative environment in which the United States was regarded as God’s favored nation, Hyatt was aghast to find the sanctuary frequently decked out in red-white-and-blue bunting with a pair of 50-foot American flags. In the Sunday service nearest the Fourth of July, congregants recited the Pledge of Allegiance and sang patriotic songs. As the pattern continued through the early months of the Iraq war, Hyatt could hold his tongue no longer. At a pray-for-our-troops rally at the megachurch, he took a turn at the microphone and cited the teachings of Jesus in making the unpopular suggestion that the congregants also pray for Saddam Hussein and the Iraqi people. He went on to write an Internet article titled, “Profoundly Disturbed on the Fourth of July,” which was not well-received at the church and led to his leaving its staff. Would those words arouse the ire of Americans today? Of some, probably. My own response to Roosevelt’s religious invocation is colored by indelible memories of my visit to the World War II cemetery in Normandy. I still have vivid mental pictures of the graves of the American soldiers, of the crosses laid out in row after solemn row. Interspersed throughout the cemetery were many Stars of David, rising over the graves of the fallen Jewish soldiers whose role in the fight has special poignancy. No doubt, faith has long played a role in the American military, but it has been an inclusive faith, one respecting a diversity of denominations and religions, with chaplains of different stripes available to assist soldiers on their own religious terms. Contrast that with what’s been happening in the military in recent years, where sometimes-coercive Christian evangelizing has triggered lawsuits and lent a crusader overtone to the fight against terrorism. Contrast that inclusive tradition with rhetoric that portrays Jesus as America’s “commander in chief” and efforts by a group called Christian Embassy to proselytize to our diplomatic corps and military leadership. Is militaristic Christian nationalism really where we want to take this country and our dominant religion? Obama went on to cite the prisoner abuse scandals at Abu Ghraib and “unjust” detentions at Guantanamo as examples of the abuses of which we are capable when we become too convinced of our inherent God-sanctioned goodness. May patriots honor the flag on the Fourth of July. And may religious people revel in the beauty of their faiths. But let’s remember that being Christian is not a requirement of patriotism. And that patriotism is most assuredly not a requirement of being religious. Let’s honor the flag and faith — by keeping a reverent measure of distance between the two. Tom Krattenmaker, who lives in Portland, Ore., specializes in religion in public life and is a member of USA TODAY’s board of contributors.